Microsoft today announced the launch of Draft, a new open-source tool that helps developers streamline the processes of developing container-based applications that are meant to run on Kubernetes clusters. The main idea here is to allow developers to work on their applications without knowing anything about Docker and Kubernetes. Indeed, they don’t even need to have either of those tools installed on their machines to get started. Back in April, Microsoft acquired the Deis container platform from Engine Yard; today’s release marks the first result of this acquisition. Deis set out to make using containers easier to use for developers and launched a number of open-source tools like Workflow, Helm and Steward before the acquisition. Unsurprisingly, this new tool builds on some of this previous work Deis did. “Draft targets the ‘inner loop’ of a developer’s workflow — while developers write code, but before they commit changes to version control,” the team explains in today’s announcement. 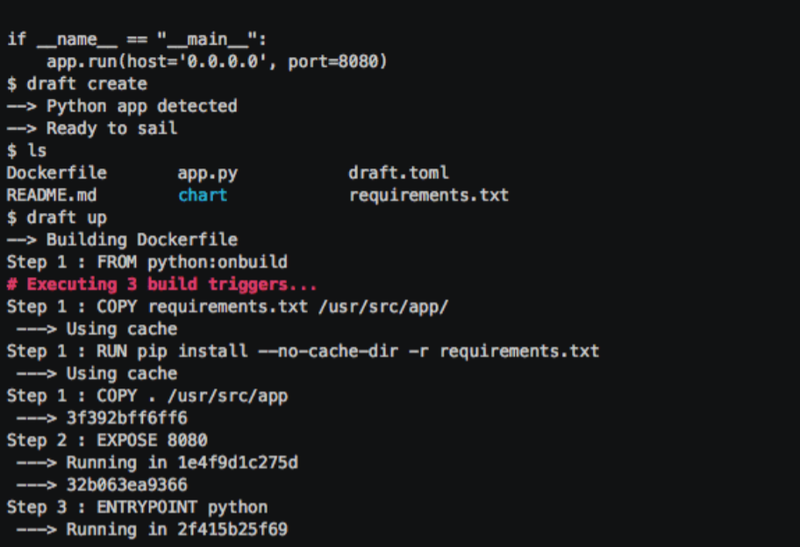 Using Draft, developers can use a single command (“draft create”) to create a so-called “Draft pack.” Draft automatically detects the language your code was written in (with support for Python, Node.js, Java, Ruby, PHP and Go built-in) and then builds this pack by writing the detection script, a Docker file and Kubernetes Helm chart into the source tree. From there, it should be pretty easy to integrate this code with existing continuous integration pipelines. Using another command, developers can start working on their applications locally and the code is automatically shipped to any Kubernetes development cluster — no matter whether it runs locally or remotely. Any local changes they make should be made available on the cluster within a few seconds. “This allows developers to edit code locally, but have their dev environment running in the cloud where they can access all their app’s production dependencies,” the team explains.